You spend a good deal of time searching the internet for just the right planner printables. You fiddle with your printer settings. Wrestle with the paper cutter. 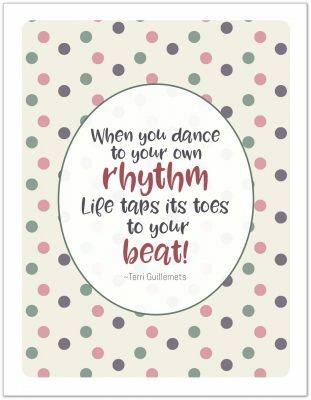 And celebrate when you finally have your planner set up how you want it. For a few weeks, maybe even a few months, all is good. Your planner is your trusted tool in your efforts to keep track of how you’re spending your time. Then the honey moon phase ends, life starts creeping back in, and before you know it your planner is collecting dust. Despite your best intentions, you just don’t have the time to sit and plan. Sound familiar? You’re not alone. It happens to all of us. One of the ways I combat planner abandonment is by making my planning process as quick and easy as I can. 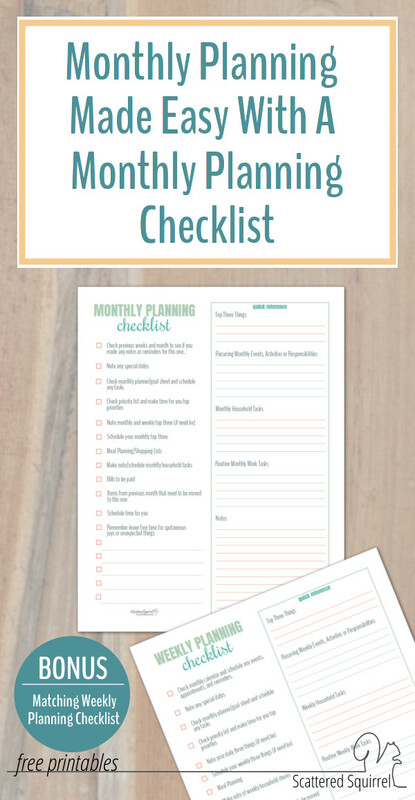 Part of my planning process involves using a monthly planning checklist to streamline my planning time. We put so much effort into making or buying the right planner for us, and then somehow we stop using it. Often times we don’t even notice right away. It’s this shift between loving our new planner and having time to maintain it that often leads to planner apathy. It’s why so many of us try multiple planners throughout the year seeking the illusive planner peace. The good news, is that with a little preparation, planning can be really quick and easy. This where my monthly planning checklist will come in really handy. 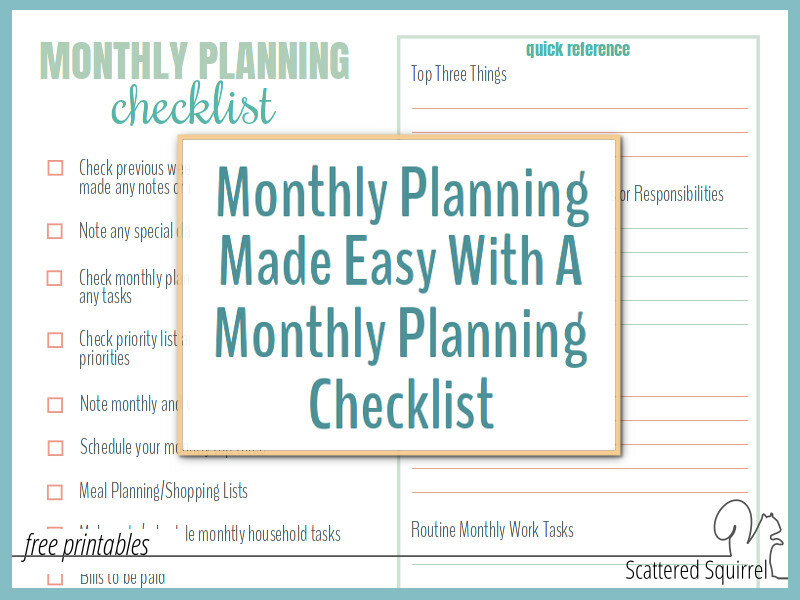 For anyone who followed along with the From Scattered to Sane series, the monthly planning checklist might look familiar. 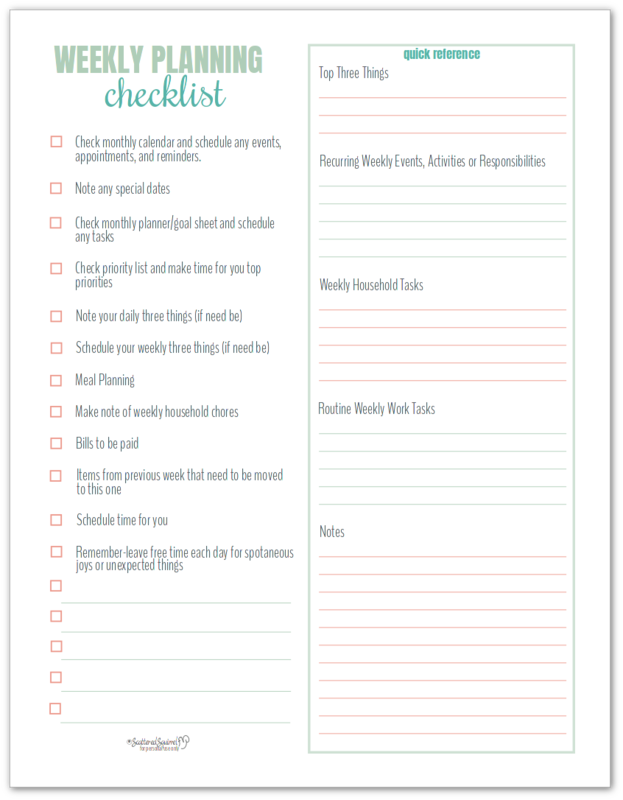 It’s almost identical to the weekly planning checklist I shared during the series. Up until last month, this monthly version was just a handwritten page I keep in the back of my planner. Because it has had such a huge impact on my monthly planning, I thought it was past time I shared it with you. This printable is really simple. It’s just a checklist on one side and a quick reference list on the other. Together these two sides make monthly planning super easy. Let’s start with the quick reference side. Starting off this section is the Top Three Things you need to do each month. These will be different for everyone, but they should be something you need to do once a month. A high priority item. It could be anything from filing the receipts for the month to planning a family outing. Following that are the space to record the things happen each month. There is a space for life in general, home, and work. By writing those items down, you don’t need to think about them when you’re planning your month. You can just sit down with your planner, pull out your monthly planning checklist, and start planning. The checklist makes it super easy to plan your month quickly. You’ve already taken the time to decide what you need to do each month, so it’s just a matter of putting them all into your monthly calendar. 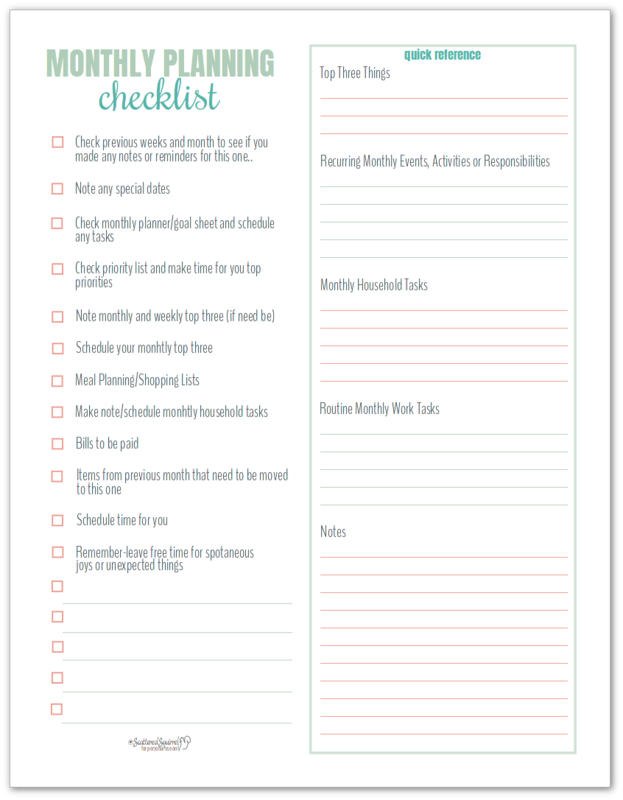 By having the steps listed out in a checklist you don’t have to try to remember what all you need to plan for each month. Just go down the list item by item and schedule things out as you need to. In addition to the monthly planning checklist I also use a couple of other reference sheets to help make my monthly planning even easier. The Indoor and Outdoor Home Maintenance Checklists – these let me quickly see what I need to plan to do each month. By using this format, my monthly planning now takes me less time than ever. I have peace of mind knowing that even if life gets crazy and I don’t have time to plan each week, the important things are all noted on the monthly calendar. I know many of you like to have printables that match, so I updated the weekly planning checklist to the match the monthly one. As you can see, they’re almost identical, with only a few minor differences in the items in the checklist. I use this one the same way I use the monthly one, which makes planning my week really quick too. I don’t have to try to remember everything, it’s all ready written down for me. It makes planning so much easier to have reference lists and checklists. Now that the planning part is easier, I’ve been able to better tell what is and isn’t working for me in my planners and I can adjust accordingly. No longer are they sitting in a forgotten corner, but they’re being used on a daily basis, as they should be. I’d love to hear about how you use your planner. Do you have a planning system or routine your follow each month? Are you still trying to figure out what works best for you? Drop me a line in the comments down below and let me know. I love seeing the printables in action! If you use one of the printables and happen to share it on social media, use the hashtag #scatteredsquirrelprintables or tag me in the photo and I’ll be happy to hop over and check it out! Hi Alli! I LOVE the monthly and weekly planning checklists. Often I sit down to plan and my mind goes completely blank! Any suggestions for how to print these to fit in a mini happy planner? I just switched and I really like it- small enough to fit in my purse, but large enough to write in still! Only problem is they seem to be a unique size all to themselves, any suggestions would be greatly appreciated! Hi Emilie, Thank you so much for your kind words. I’m happy that you enjoy using the checklist. I’m not one hundred percent sure about printing them for a mini happy planner. I think you could try printing the half-size ones at 80% and them trimming them. That might work best. I don’t have a mini happy planner so I can’t really test it out. Sorry I couldn’t be more help.